Objective To explore acute and late coronary outcomes and their risk/modifiers in patients with Kawasaki disease (KD). Setting and patients 1073 patients with KD identified from a tertiary care medical centre (1980–2012; 8677 patient-years). Main outcome measures The acute coronary severities and late outcomes (survival free of coronary aneurysm persistence and ischaemia) were assessed. Results Coronary arterial lesions occurred in 40.6% of cases at their acute febrile stages, and persisted beyond 1 month in 196 (18.3%, M/F=138/58) patients: 125 (11.6%) had small aneurysms, 44 (4.1%) had medium aneurysms, and 27 (2.5%) had giant aneurysms. At follow-up (1–46 years), coronary aneurysms persisted in all with giant aneurysms, in 55% of those with medium aneurysms (18% with stenosis), and in 9% of those with small aneurysms. Ischaemia events occurred in 14 patients (M/F=13/1) and caused four deaths. Among the patients with KD with coronary aneurysms, 10-year ischaemia event-free and aneurysm persistence probability was 87.5% and 20.6%, respectively. The only independent risk for aneurysm persistence was the aneurysm severity 1 month after KD onset (χ2=80.73, p<10−3). Male patients and intravenous γ-immunoglobulin (IVIG) therapy were independent risk factors of initial coronary severity but were not associated with the late coronary outcomes, even in severity stratified subgroups. Conclusions The coronary severity 1 month after KD onset is most crucial to the late coronary outcomes. Although IVIG use improves the initial severity of coronary lesions, it does not further modify the long-term fate of coronary aneurysms. Kawasaki disease is one of the most common pediatric systemic vasculitis. With intravenous immunoglobulin therapy, the risk of coronary arterial lesions for patients with Kawasaki disease has been reduced from 20–25% to 5–10% during the acute stage. However, the late coronary profiles and their risk factors are still unclear. The only independent risk factor for aneurysm persistence or ischaemia events was aneurysm severity 1 month after Kawasaki disease onset. Male patients and intravenous immunoglobulin therapy were both independent risk factors of initial coronary severity but were not associated with the late coronary outcomes, even in severity stratified subgroups. Since the first report in 1967 from Japan, Kawasaki disease (KD) has become the most common form of paediatric systemic vasculitis.1 Despite receiving intravenous immunoglobulin (IVIG) therapy, coronary arterial lesions (CALs) occurred in 5–20% of patients with KD during the acute stage.2–4 CAL may persist and even progress to stenosis or obstruction. Therefore, CAL following KD is now the leading cause of acquired heart disease in children.3–7 In our previous study focusing on the period before the introduction of IVIG therapy, CAL occurred in 44% of patients.8 Among them, most of the dilation regressed and all giant aneurysms persisted. IVIG therapy became available in 1986, but only became standard treatment after the implementation of Taiwan's National Health Insurance programme in mid-1995, which covers the expense.7 ,9 The relationships between late KD coronary outcomes and the risk/modifiers, like gender and IVIG use, have never been studied as yet. We therefore conducted a longitudinal study based on patient enrolment since 1980 to delineate this issue. The study was approved by our Institutional Research Board. The diagnosis of KD in this study was made based on clinical criteria for KD.10 All children received echocardiography during the febrile stage and the subacute phase (1, 3, 6 weeks, and 3 months after fever onset, and the subsequent frequency varied depending on the severity of the CAL), except patients diagnosed before 1984. CALs were defined as previous studies.4 ,11 However, only cases where CAL persisted for more than a month after disease onset were considered as coronary aneurysms. 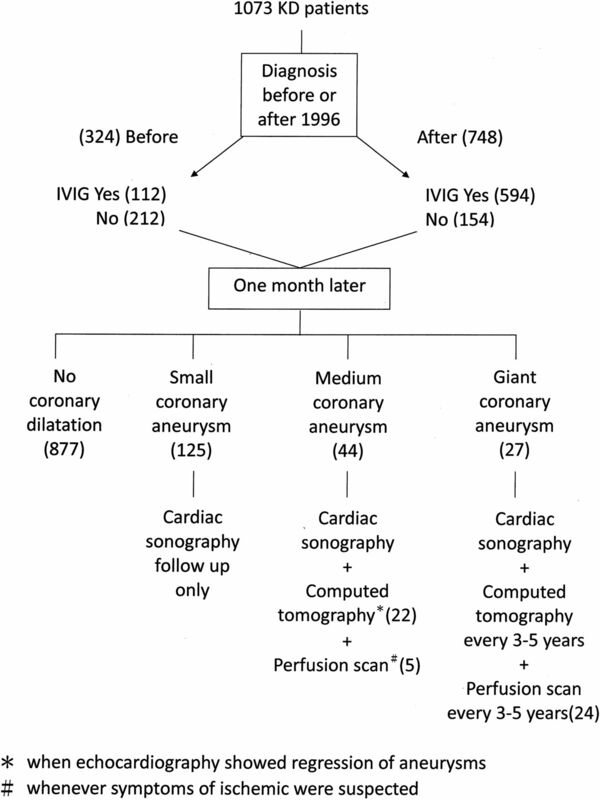 Based on the aneurysm size, the severity of coronary aneurysms was classified as small (≤4 mm), medium (4–8 mm) and giant (>8 mm).4 CALs and the regression were diagnosed based on two-dimensional (2D) echocardiography and confirmed using CT or angiography if indicated (when 2D echocardiograms showed regression of coronary aneurysms that had been greater than 4 mm, or for the patients who exhibited symptoms of myocardial ischaemia, or for a regular follow-up of giant aneurysms every 3–5 years, figure 1). For patients with echocardiography follow-up, regression was defined when echocardiography demonstrated coronary arteries with normal appearance and size, as well as normal cardiac function. Low-dose aspirin was given for at least 6–8 weeks and until when echocardiography confirmed the regression of coronary lesions. ECG was performed annually and whenever patients reported chest tightness. Diagnosis of myocardial ischaemia was made based on ST segment changes and/or stress radionuclear imaging results (figure 1). Flow chart of management and follow-up of 1073 patients with Kawasaki disease (KD) (IVIG, intravenous immunoglobulin). We performed analyses using SPSS V.11.5. Data were expressed as mean±SD (medians with ranges), and we used Mann-Whitney test for two-group comparisons. The χ2 test was used to compare categorical data. For the time-related events and outcome variables, like persistence of coronary aneurysm, we used Kaplan-Meier estimates to draw event-free curves and tested their associations with candidate-independent factors by using log-rank tests. To estimate regression probability, the follow-up period ended when the CAL regressed or patients did not attend the scheduled follow-ups. Variables related to time-related events with p<0.1 in the univariable analysis were entered into the multivariate model. Statistical significance was set at p<0.05. Between 1980 and 2012, 1073 patients were diagnosed with KD (M/F ratio=664/409, 1.62), including 22 with atypical KD with CAL. The age at diagnosis ranged from 1 month to 18 years (median 1.59 years). The proportions of patients with infancy onset (28% vs 34%, p=0.09) and male (61% vs 63%, p=0.46) in patients without and with IVIG were not statistically different. IVIG therapy was not administered in 366 patients (34.1%). Our national health insurance was implemented in mid-1995 and reimbursed the IVIG only when fever persisted for more than 5 days and (1) more than four presentations of diagnostic criteria were fully filled or (2) there were less than four characteristic criteria but positive coronary involvement. Hence, to avoid the potential selection bias due to the diagnostic era, we stratified our cohort into two strata: early group (1980–1995) and late group (1996–2012). IVIG was given in 34.6% (112/324) and 79.4% (594/748) of the early and late group of patients with KD, respectively (χ2=200.2, p<10−4, figure 1). None received corticosteroids. CALs occurred in 40.6% of the patients at their acute febrile stages. Coronary aneurysms, defined as CALs that persisted beyond 1 month of KD onset, were noted in 196 patients (18.3%, M/F=138/58): small aneurysms in 125 patients (10.3%), medium aneurysms in 44 patients (4.6%) and giant aneurysms in 27 patients (2.5%) (table 1, figure 1). Male patient was significantly associated with coronary severity at KD onset or 1 month later (p<0.01) in the early and late groups. We failed to demonstrate the association between IVIG resistance and coronary severity (p=0.38). In the early group, coronary regression within 1 month after KD onset occurred in 54.1% (20/37) of those with IVIG and 29.7% (19/64) of those without IVIG (χ2=7.68, p=0.006), respectively. In the late group, though the percentage of coronary regression within 1 month was still higher in those with IVIG (62%, 191/308) than in those without IVIG (44.8%, 13/29), the difference was only borderline due to the small number of patients without IVIG (χ2=3.28, p=0.07). The time intervals between KD onset and the latest follow-up ranged from 1 to 46 (median 5.63) years for all patients, and from 1 to 46 (median 6.67) years for patients with coronary aneurysms. Four deaths occurred and all were male (mortality 0.4% of patients with KD, 2.0% of patients with coronary aneurysms and 14.8% of patients with giant aneurysms): one died at 3 years of age because of acute myocardial infarction (AMI), another died at 3 years of age after a heart transplant for ischaemic cardiomyopathy and the last two died suddenly at 16 and 23 years of age, respectively. All four had giant aneurysms. The 10-year and 35-year survival rates of all patients with KD were 0.99 and 0.98, respectively. Regarding the late coronary outcomes, among the 877 patients without initial CAL or with transient dilation, none experienced cardiac symptoms or had any positive imaging of CAL during the follow-up (6994 patient-years). Among patients with coronary aneurysms, the coronary aneurysms persisted in 31.4% of the patients during follow-up. The probability with persistent coronary aneurysm at 5 and 10 years after KD diagnosis were 27.4% and 20.6%, respectively (figure 2A). Univariable survival analysis conducted by log-rank test revealed coronary severity 1 month after onset (χ2=80.73, p<10−3) and the era of diagnosis (after 1996, χ2=4.99, p=0.025) was associated with the persistence of coronary aneurysms. Further stratified by the coronary severity 1 month after onset, the factor of diagnosis era (after 1996 vs before 1996) lost its association with aneurysm persistence (χ2=0.068, p=0.795). Myocardial ischaemia, AMI or death occurred in 14 patients, and only one was female (14/196=7.1%; 13 had giant aneurysms and one had a medium aneurysm). All types of ischaemia event-free rates at 10 and 20 years after KD diagnosis were 87.5% and 73.5%, respectively. Univariable analysis showed two possible risk factors: the severity of the coronary aneurysms 1 month after KD onset (χ2=33.46, p<10−3) and the diagnosis era (after 1996, χ2=6.43, p=0.01). Further stratified by the coronary severity 1 month after onset, the factor of diagnosis era lost its association with ischaemia events (χ2=3.71, p=0.054). 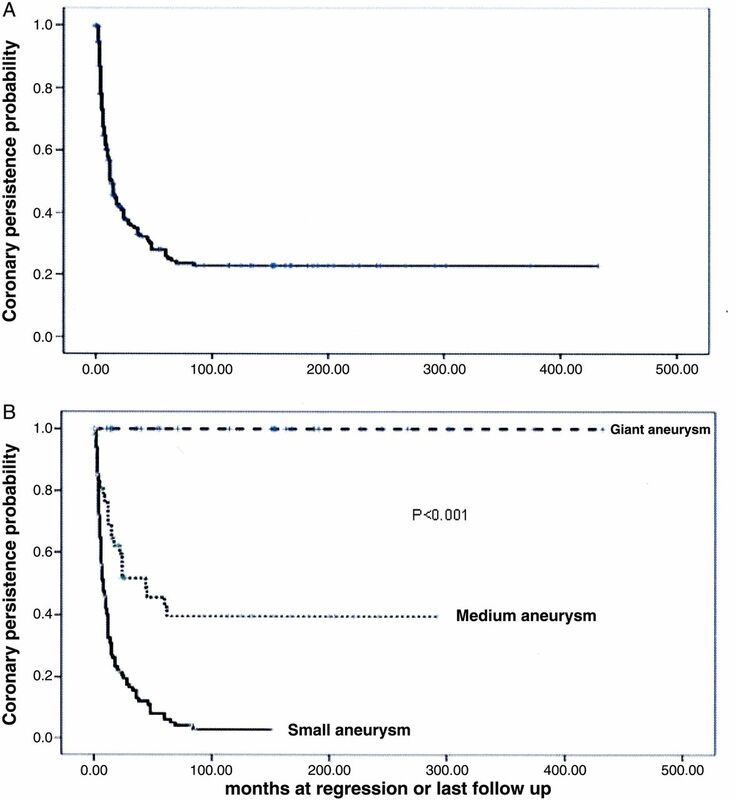 Kaplan-Meier event-free curves showing the probability with persistent coronary arterial aneurysms (A) in those with coronary aneurysms and (B) in the three groups of patients (small, medium and giant coronary aneurysms). To avoid the potential confounding effects of coronary severity, we stratified our cohort into three subgroups based on coronary severity 1 month after KD onset and evaluated the roles of IVIG therapy and gender on the late persistence of coronary aneurysms. None of the giant aneurysms regressed during follow-up. In the subgroup of patients with KD with giant aneurysms, the 5-year and 35-year survival rates were 0.92 and 0.69, respectively. Except for the four deaths, four additional male patients were diagnosed with AMI, and two of these diagnoses occurred within 1 year of KD onset. Collectively, the incidence of AMI or death in patients with giant aneurysms was 26%, and 67% of the AMI occurred within the first year of KD onset. Clinical evidence of ischaemia as documented in nuclear medicine studies was also noted in a further five patients (18.5%), and only one was female. Kaplan-Meier curves for survival free of AMI/death and free of all ischaemia (including ischaemia, myocardial infarction and ischaemia-related death) in patients with KD with giant aneurysms are shown in figure 3A, B. AMI/death-free survival rates were 0.76 and 0.69 at 10 and 20 years after KD onset, respectively (figure 3A). Ischaemia event-free survival rates were 0.63 and 0.36 at 10 and 20 years, respectively, after disease onset (figure 3B). Men tended to have AMI and ischaemia, and only one ischaemia patient was female. Five-year ischaemia event-free survival rates were 0.68 and 0.75 in patients with giant aneurysms with KD with and without IVIG, respectively. We did log-rank tests but failed to demonstrate an association of all ischaemia with the gender (χ2=1.01, p=0.32) or IVIG therapy (χ2=1.51, p=0.22). Kaplan-Meier curves for survival free of AMI/death (A) and all types of ischaemia (myocardial ischaemia, acute myocardial infarction or death) (B) in patients with giant coronary aneurysms (AMI, acute myocardial infarction; KD, Kawasaki disease). In those with medium aneurysms, no death occurred and only one patient with persistent coronary aneurysm and stenosis/calcification had clinical evidence of myocardial ischaemia. However, coronary aneurysms persisted in 24 (54.5%) patients and were associated with stenosis in 8 patients (14.8%), and calcification in 4 patients (9.1%). The coronary aneurysm persistence probability at 6 months, and at 1, 2 and 5 years after KD onset was 81%, 74%, 60% and 46%, respectively (figure 2B). Ten of the 50 patients with medium aneurysms had aneurysms larger than 6 mm. The chances of coronary persistence and the development of stenosis or calcification were similar to patients with aneurysms between 4 and 6 mm. The 5-year coronary aneurysm persistence probability in patients with IVIG and in those without was 49% and 39%, respectively. We did not identify any coronary persistence risk factors in this subgroup (male χ2=0.09, p=0.77; IVIG use χ2=0.45, p=0.50). In patients with small aneurysms, only one patient reported chest pain that was associated with T-wave inversion without cardiac enzyme elevation. However, the imaging including CT, cardiac catheterisation and nuclear medicine results was all negative, suggesting resolved coronary aneurysm morphology. Coronary aneurysm persisted in 11 patients (8.8%), mostly in patients with a short follow-up. The probability of small coronary aneurysm persistence at 6 months, and at 1, 2 and 5 years after KD onset was 55%, 31%, 20% and 6%, respectively (figure 2B). The 5-year coronary aneurysm persistence probability in patients with IVIG and in those without were 8.3% and 5.6%, respectively. No risk factors were identified to predict coronary persistence (IVIG therapy χ2=0.19, p=0.91; gender χ2=0.24, p=0.63). To avoid the error of classifying those patients with KD with a naturally dominant right coronary artery system into the small aneurysm subgroup, we further examined the 125 patients with a small aneurysm and found that 10 of them were right coronary artery dominant. The coronary aneurysms of the right coronary artery in these 10 patients regressed to the normal range during follow-up. Therefore, such misclassification did not happen in the current study. IVIG is the standard therapy for acute KD, and this study demonstrated that, among patients with CALs, coronary regression within 1 month after KD onset is more likely to be observed in patients with IVIG. However, IVIG use did not further modify the late coronary outcomes, including the aneurysm persistence, AMI/death events and ischaemia. Pathology studies of patients with KD have demonstrated that mononuclear cell infiltration in the coronary vessel walls only predominate within 40 days after KD onset.12 ,13 Thereafter, abundant smooth muscle cells substitute together with vascular remodelling and collagen accumulation. Such clinical and pathology findings suggest that the immunomodulation by IVIG or any other agents should be aggressively delivered as early as possible to improve the coronary severity within 1 month after disease onset. The favourable prognosis of small coronary aneurysms has been described.5 ,18 ,21 All small aneurysms regressed. However, giant or medium aneurysms clearly add to the cardiovascular risk and such subgroups of patients with KD need more frequent follow-up. In medium aneurysms, we observed that approximately half of the aneurysms persisted, and one-fifth of those with persistent aneurysms exhibited associated stenosis/calcification. However, these patients rarely developed myocardial ischaemia by early adulthood. A previous study demonstrated that at a 10-year follow-up, the probabilities of regression and developing stenosis of the medium coronary aneurysms were 32% and 20%, respectively.22 They also suggested a cut-off threshold for the development of stenosis as 6 mm for coronary aneurysms, which was not observed in this study. MRI had been successfully applied to patients with KD for the cardiac evaluation, including the aneurysm, aneurysm, perfusion deficits and scarring.23 This would be a better alternative to CT, which is associated with risk from ionising radiation. This study was subject to certain limitations. First, this was a retrospective study with a prolonged observation period. Therefore, the chance of early identification and treatment of KD might increase in recent years. The resolution of the echocardiography most likely increases over time, and the proportion of dilations or even small aneurysms might have been underestimated in those diagnosed in an earlier era. Better resolution of echocardiography might also result in increased detection and earlier diagnosis of KD. These would cause important lag time bias. Second, the diagnosis and timely treatment of KD may also have improved over time, and may be another compounding factor influencing the IVIG therapy widely used after the late 1990s. Third, the current study design was difficult to show the effects from aspirin dosage changed over time. Finally, the number of patients with medium and giant coronary aneurysms was 44 and 27, respectively, and was relatively small to assess the relationship between the treatment and outcomes. In this longitudinal observational study of patients with KD, we observed that coronary severity 1 month after KD onset is most crucial to the late coronary outcomes, though male patient and IVIG therapy were both independent risk factors of initial coronary severity but were not associated with the late coronary outcomes, even in severity stratified subgroups. Aggressive risk modification for patients with KD with giant and possibly medium coronary aneurysms should be addressed.
. Acute febrile mucocutaneous syndrome with lymphoid involvement with specific desquamation of the fingers and toes in children. Arerugi 1967;16:178–222.
. Prognosis of coronary arterial lesions in Kawasaki disease treated without intravenous immunoglobulin. Acta Paed Sin 1997;38:32–7.
. Kawasaki disease with particular emphasis on arterial lesions. Acta Pathol Jpn 1991;41:785–97.
. Longterm outcomes in patients with giant aneurysms secondary to Kawasaki disease. J Rheumatol 2005;32:928–34. Contributors M-TL and L-CS worked on data collection, interpretation and the initial manuscript. E-TW, J-KW and H-CL worked on data interpretation. M-HW had full access to all the data and takes responsibility for the integrity of the data and the accuracy of the data analysis. Funding This study was supported in part by a grant from the Taiwan National Science Council (NSC 100-2314-B-002-085-MY3). Ethics approval Institutional Review Board of the National Taiwan University Hospital.